Pic was taken Sept 2016 IIRC. any idea of the reg or location? No, there weren't any comments on the pic, and I only found it by luck while browsing away the boredom. Z Cars or Softly Softly? Hi, I would say it's Softly Softly because of the absence of Brian Blessed. Thinking about that, was it him not being there that gave the programme its title? A little confusing that picture, Colin Welland ( third from right) was in Z-Cars but not Softly Softly so not sure why he's there. Now I've got that damn Z-cars theme running through my mind and it won't go away! That was 1964 2000 EOO 700B. Owned by a Michael Paul Silvester or his Dad. That was 1964 2000 EOO 700B. 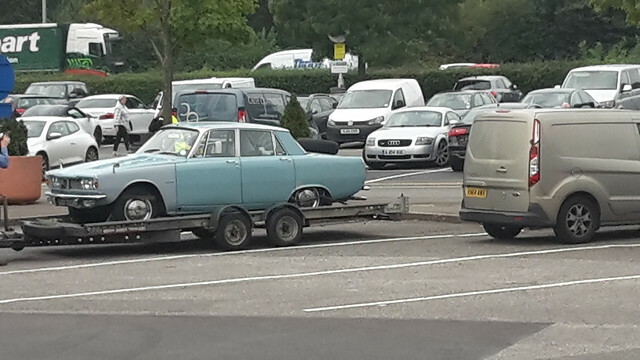 I had that in my mind as IIRC it's been mentioned on here before and it's a pretty distinctive registration. EOO 700B. It's mine. I was just collecting it from oop north when this photo was taken. It should be back on the road this week hopefully. I looked at this thread earlier today and later picked up one of my books and thought 'I've just seen that photo' somewhere! According to the book it was a photoshoot of the cast of 'the new edgy police series Z-Cars'. Dated 27 September 1965. ETA, Just realised there's an earlier post relating to it, which I missed, but photo had been lost.